Long ago, I quit telling Dr. King how much I remembered, because the increase in Tonics made me so sick, I couldn't eat. It's best to keep some things to myself. No one needs to know what's in my head. That irreverent thought made me want to tell on myself, but I pushed it away. "None of those things will happen, Shiloh," I said. "Please, please don't let that happen." I kept my voice quiet, but in the dark hall the words felt like they floated near the doorways, waiting for someone to follow behind and collect what I'd said. 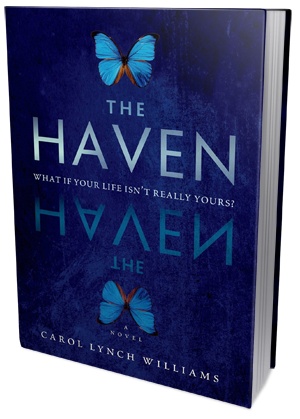 The Haven is one of those books that you have a general idea of what is going on but you pull through the pages because it's fast paced. Admittedly, it does remind me of some more popular reads out there but it also felt more simple than that. This made the read easy and the type that you breeze through because it's really a n brainer. Sometimes you just want an easy and quick read and I believe this one worked because it was picked up at the right time for me. Fast paced is an easy way of describing this read but it does have a slower start. However, this slow start does not last long and it is easy to forget because it just takes off. There is a consistent pace and Shiloh is barely given a moment to consider something before the next piece of info is right in her face. The kids in this place are classified as Terminals, carrying an infection/disease that ensures that they are separated from society, or at least that is what they are told. The pacing though fast, keeps your mind going trying to keep up and confirm what you will believe is going on. Admittedly a few of the things confused me but that is all part of the story, and it does come together and make sense as long as you hang on. Shiloh and her friend Abigail have been together for a long time, but that does not make it easier. What I liked about these two was that they were different. It was obvious that there was a connection but there was denial laced in it because they are not meant to have emotions, not meant to feel things. Shiloh feels more than she should and knows more than she should and though she believes it is wrong, taking more drugs to forget is too much for her. There were times that I found myself irritated with her need to comply and yet the more rational part of me knew that there was a reason she was driven to do so. Once you add Gideon into the mix, there is a serious conflict of beliefs and emotions. I personally believe that the development, as you mixed the characters and moved forward, was great. No character was perfect, nor were there interactions but I found the development and the reasons behind it were realistic. Though The Haven wasn't perfect, I did enjoy the ride. Carol Lynch Williams did create something that was easy to read and though it was like other reads, it was still something of its own. It's simplicity and fast pace make it a great read for someone that is looking for something that you can just enjoy without much thought. This will also work for people that like a dystopian/future based book but want something that is quick. If there is a second part to this book (which I feel there could be) I wuld pick it up.